Chronicles of a Foodie: My Favorite Things, Monday! Sorry we've been away! Lili and I have been working on our schedules and new ideas for this lovely site! We promise to try to not let life get in the way anymore! So welcome to this new weekly post! My Favorite Things, Monday! 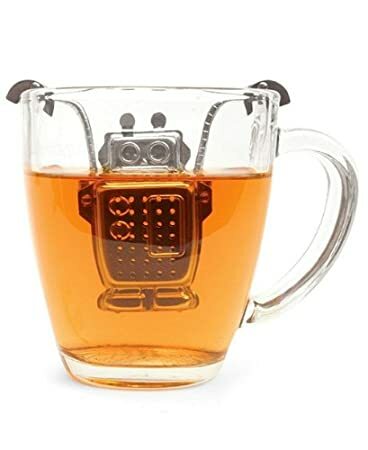 Today I present to you all one of the coolest things I've ever bought...a Robot Tea Infuser! This awesome lil' dude came from the gift shop at The Huntington Library but he can be found on Amazon! You guys. This nutella-licious frozen treat that has made my Summer. The only complaint I have is that sometimes Pinkberry is lacking on the bananas. I feel like this is sacrilegious when you're serving Chocolate Hazelnut anything. So "treat yo'self" and get some fro yo! Go sip on some delicious tea that your super cool robot steeped for you!